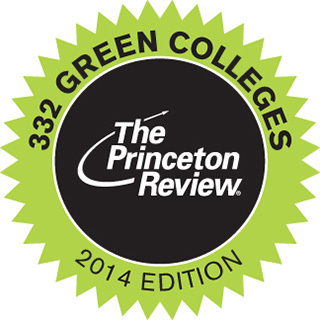 ESF is listed in the 2014 Princeton Review's Guide to 332 Green Colleges. The Princeton Review partnered with the U.S. Green Building Council to identify the schools with the nation's most eco-friendly campuses and present information about each school's sustainability, "green" majors and "green" job placement. "SUNY-ESF is the only school in the nation where all of its academic programs are oriented toward natural resources and the natural and designed environments," the book states. "With sustainability at the core of the university's mission, SUNY-ESF has been at the forefront of nationally-recognized, government-supported research in green issues. SUNY-ESF's career center is dedicated to placing students in internships and careers in the science, design, policy, and management of the environment and natural resources." The Princeton Review chose the schools based on a survey the company conducted in 2013. The survey asked administrators at hundreds of colleges across the United States and Canada about their institution's sustainability-related policies, practices, and programs. Using survey data that covered more than 25 fields, The Princeton Review tallied its "Green Ratings" (scores from 60 to 99) for 832 schools and reported them in the school profiles on the Company's website and in its college guides in summer 2013. The 332 schools in this guide received scores of 83 or above in that assessment.
' School profiles with information on admission, financial aid, and sustainability initiatives, plus "Green Facts" sidebars reporting on everything from the school's use of renewable energy, recycling and conservation programs to the availability of environmental studies and career guidance for green jobs.
' Lists of schools in the guide with LEED-certified buildings and of those that are signatories of the American College & University Presidents' Climate Commitment.
' Advice for living green on campus, plus a glossary of 40+ green terms and acronyms from AASHE to "zero waste."